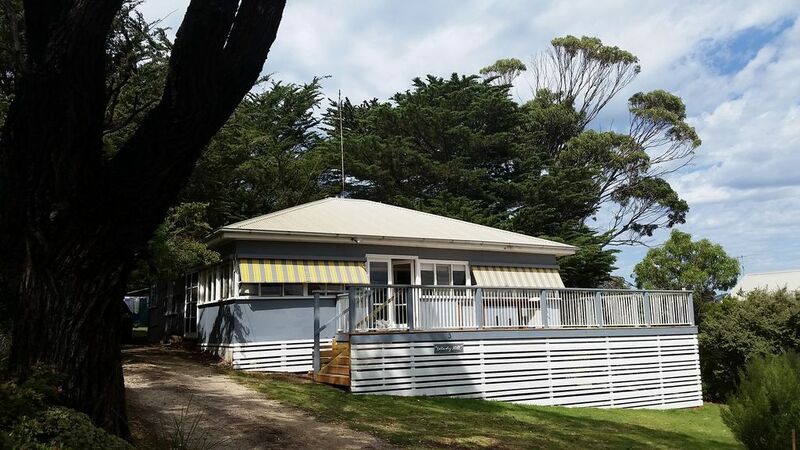 Situated in the leafy lighthouse precinct of Aireys Inlet, Windy Hill is only minutes walk away from the Split Point Lighthouse and tearooms. Even closer is Steppy Beach, where you can swim or snorkel or just enjoy the quiet cove. Kids will enjoy the playground, sanctuary and the inlet, all within a stones throw of Windy Hill so you can put the car away! Even the shops are a delightful stroll up the cliff walk with spectacular views along the coast. Windy Hill is one of the original beach houses of the Great Ocean Road. In winter you can sit by the wood fire and catch up with your favourite movie in front of the large screen TV. Or enjoy the winter sun from the enclosed verandah or north facing deck where a gas barbecue and outdoor furniture are provided. It has the retro beach house vibe that will take you back to holidays with your grandparents with the convenience of modern day touches such as a dishwasher and large deck. Windy Hill sleeps up to 8 with 2 bedrooms with Queen sized beds, and one with a Double and a set of Bunks. We do not supply linen but it is available on request for a fee per person. And don't forget to pack the coffee for the coffee machine. We understand the need for affordable family accommodation and provide a homely, well positioned house in the highly sought after lighthouse precinct of Aireys Inlet. And if you are staying for a weekend, we can help you make the most of Sunday with a late checkout. No car? Windy Hill is just 400 metres from the bus stop and within easy walking distance of shops and beaches. Please note that being an older style home we do not have air conditioning or central heating, but rely on the woodfire to keep the house warm. There is one radiator, but you will need to light the fire on those cooler nights. Wood is supplied. Aireys Inlet boasts a stretch of coast where a wide variety of pursuits can be enjoyed. Surfing, swimming, canoeing, snorkelling, cliff and beach walks are all within walking distance of Windy Hill. And you can always head up the valley to the Great Otway National Park where walks take you to waterfalls, fern gullies and steep timbered ridges. Horse riding is available and the riders can regularly be seen taking advantage of the long stretch of beach from Aireys to Fairhaven. We had a great stay at Windy Hill. We were 2 families of 4 with a dog and found the house well stocked for our needs. Everything is in walking distance...the beach, the lighthouse, the Airey’s pub, playground and shops. We also managed to get to the farmers market and school fete which was a bonus. A delightful property, understated but very well appointed. A lovely get-away, and a step back in time to a simpler holiday. The electronic distractions are there if you seek them out, but one is seriously tempted to leave the off switch in it's resting position, and just figure out how to keep warm (plenty of wood, conveniently available to feed the fire, and the fan driven heat spreads the heat around pretty well). Bring a book. We were lucky enough to catch a big blow when at 'Windy Hill', and you know it's happening. Appropriately named. Those big rollers from the southern ocean make themselves known from a distance. All good fun and looking forward to the next visit. Happy to give an unqualified recommendation to anyone who is happy to trade glass and chrome for 1950's original. Lovely well lived home in perfect location! Windy Hill was a lovely experience. The home is older style with remnants of the past in every corner! Had everything we needed during our stay. We loved the warmth of the fireplace and enjoying the beautiful morning sun on the deck. The walk to the lighthouse and beach were a stones throw! Thanks for the stay, it's definitely on our list to return. My family enjoyed a very comfortable weekend at Easter. Windy Hill is situated in an excellent location close to the lighthouse, walking tracks and the local shops. Our kids enjoyed listening to the record player and the wood fire provided a lovely warmth on chilly evenings. It was also great to sit out on the deck in the sunshine enjoying the bushland scenery. Windy Hill offers retro features with modern comforts. We thoroughly enjoyed our stay at Windy Hill. We loved the house and the location. We really enjoyed eating our meals on the deck and being able to walk to the beach, Sanctuary, Lighthouse and playground.